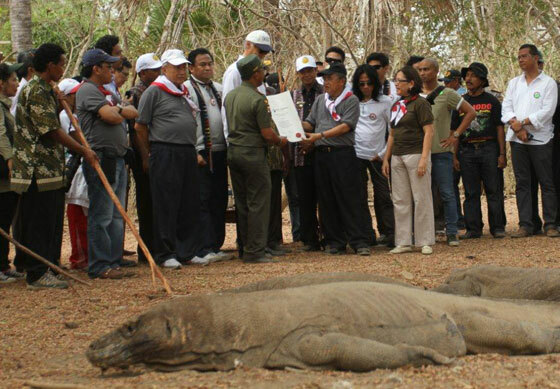 With some rather well-fed Komodo dragons warming themselves under the hot sun, Bernard Weber, founder and President of New7Wonders, handed over the official Komodo New7Wonders of Nature Certificate of Participation to the Head of Komodo National Park, one of the 28 Official Finalists in the New7Wonders of Nature, and Jusuf Kalla, former Vice President of Indonesia and now the New7Wonders lead champion in the country. The certificate was then presented to the deputy Governor of Komodo Islands, Esthon Foenay. All of this took place under the supervision of the Komodo Island rangers who stood ready to defend the crowd from the carnivorous lizards whose evolutionary development began with the Varanus genus, which originated in Asia about 40 million years ago.